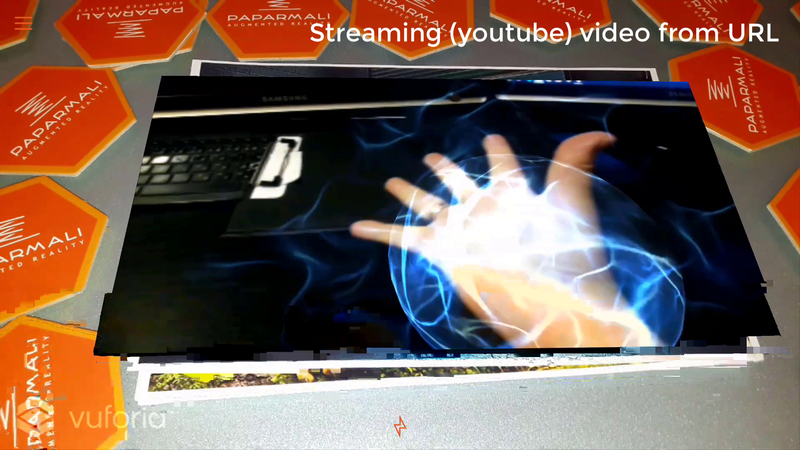 This is an Augmented Reality App based on Vuforia Cloud Recognition for Youtube Video, Music, Models, Images, Text, Phone Number, Website Augmentation. Current clients, who acquired “Mimic 15” version some time ago can get this “Paparmali 3” project update for an additional fee of 50 EUR. Latest Vuforia 8.1.7 version was used. Android and iOS versions are supported. iOS version available on App Store. Trackers can be downloaded from here. 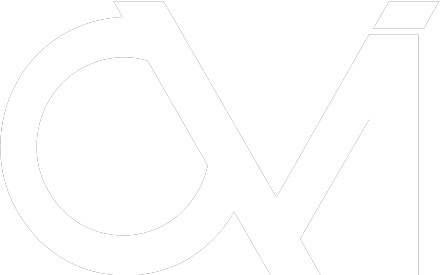 Detailed documentation on how to use this project in order to expand or adapt to your needs provided within the project. We’re happy to help you out with any question you have. 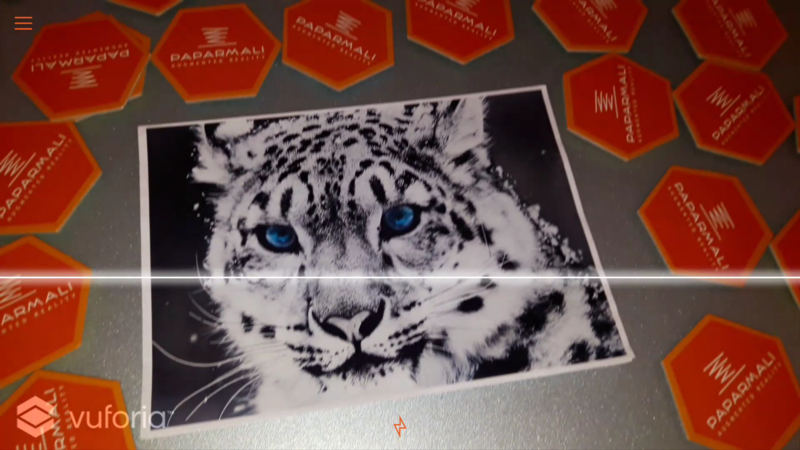 Support is TOP priority for this „Paparmali 3“ project. If you find any bug/weird behavior of the app – let us know and we will fix it as soon as possible. If Unity3D versions evolved and for some reason the project doesn’t work properly anymore – let us know and we will provide the fix to work on the newest Unity3D version you’re working on. At the moment this project should work from Unity3D 2018.3.x version and above. 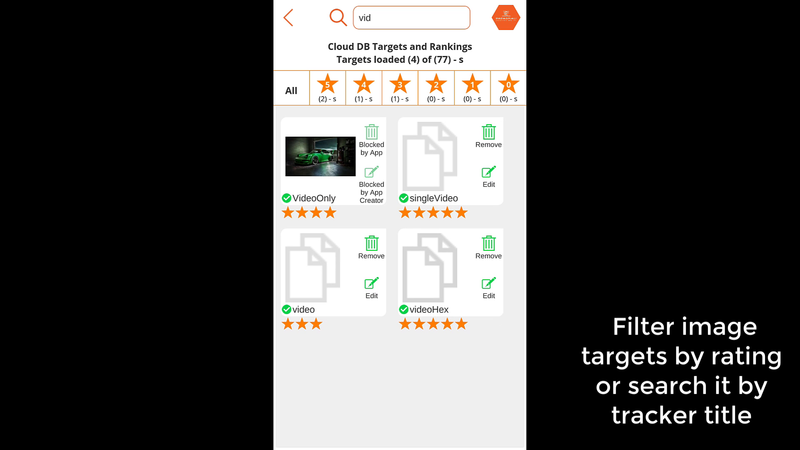 This is an Augmented Reality App based on Vuforia Cloud Recognition project in which you can upload image targets with metadata to Vuforia Cloud Database. Different content augmentation takes place from entered URLs in metadata: model, video, image, music, website, phone number etc. 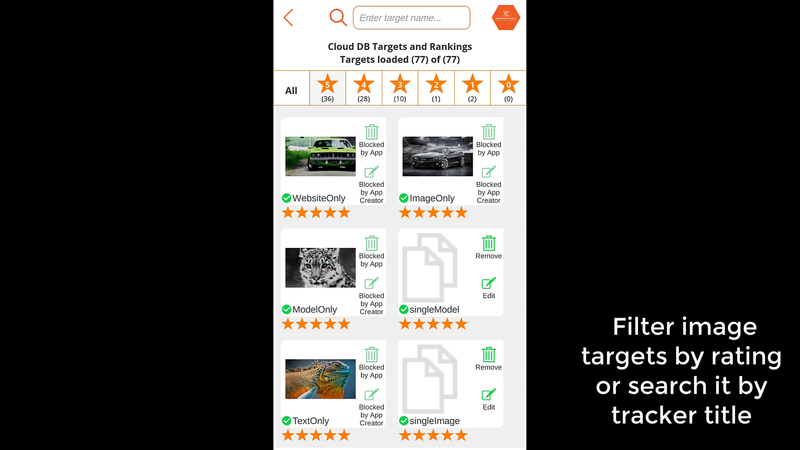 There is a possibility to view all uploaded image trackers and manage them (edit, delete), also this project allows you to filter the image targets rating and search by target title. 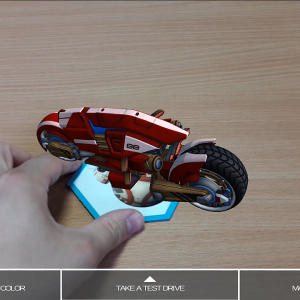 If you have a specific need to have this project working using different AR SDK‘s that supports cloud recognition (not onlyVuforia), for instance, EasyAR SDK – let us know and we can work it out. Streaming youtube video (short and full URLs are accepted). Playing a sound track from a file on server (URL). Load website as an overlay. Call to the entered Phone Number. Download AssetBundle (Model) from server and Instantiate within the app (from URL). 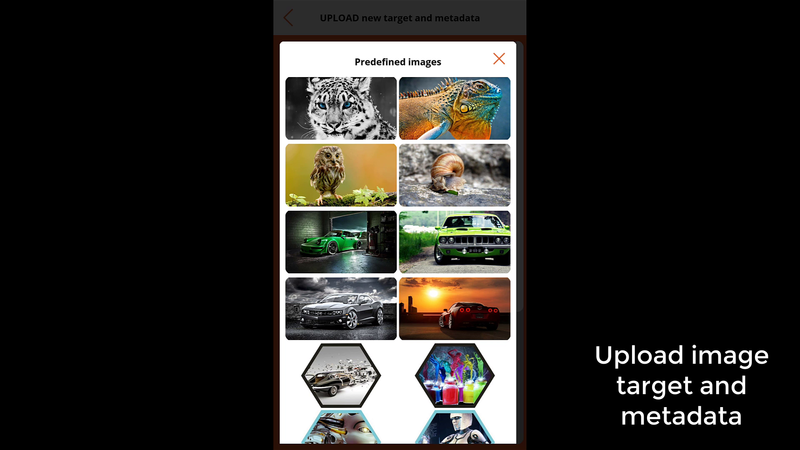 Target image selection from: gallery, predefined images (by app creator) and by using screenshot functionality. The second time the same image tracker is recognized with image or AssetBundle content – it is loaded from cache. 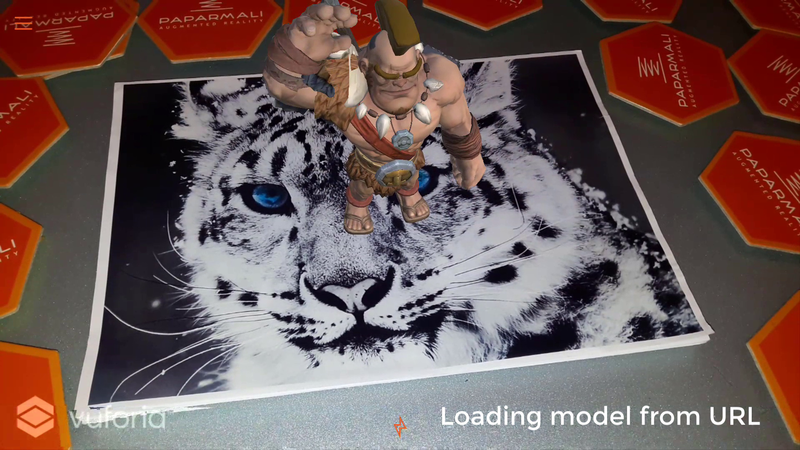 Upload image target and attach metadata from Unity3D Editor, Android and iOS platforms. If metadata consists of a single data type (URL) then the content on the image tracker is loaded instantly. If metadata consists of multiple data types (URLs) then the options (buttons) appears for user to decide which content should be loaded. None of the mentioned content above are held within the app itself. Everything is streamed/downloaded from the URLs provided within the metadata (json structure). 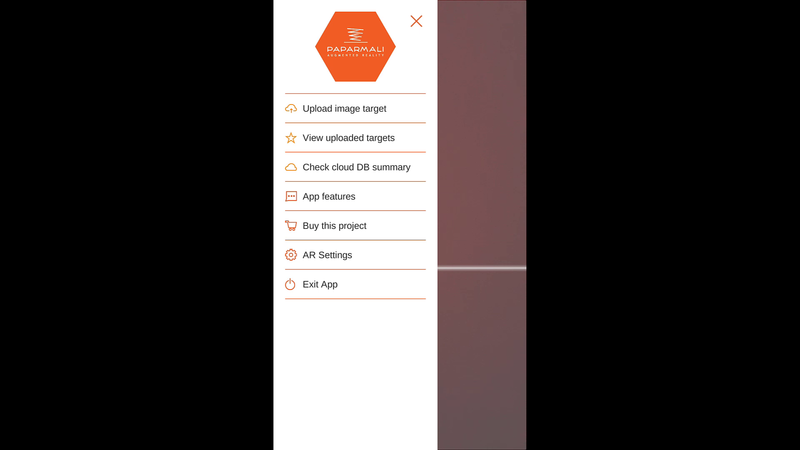 UI improvements within all project: left sliding menu, usefull informational popups, upload image target, uploaded image targets, check cloud DB summary, app features and AR settings panels. Provided the possibility to view database general statistics: active images, inactive images, failed images, processing images, total recognition, current month and previous month recognitions. 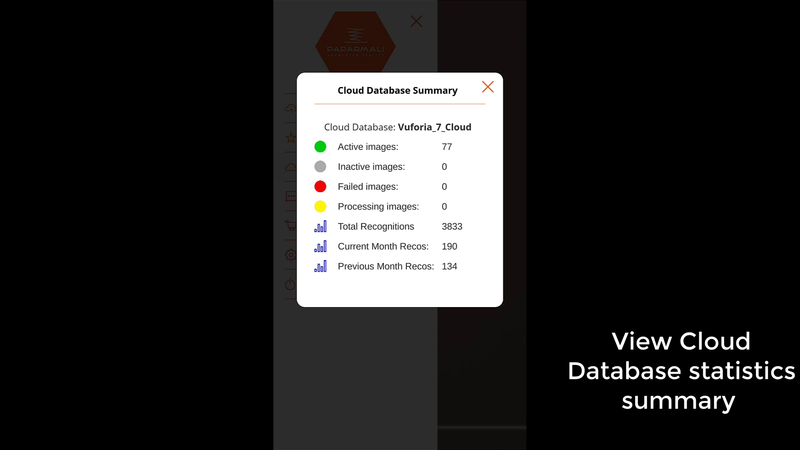 All database target images can be now loaded within the app. Each tracker name and ratings are shown. 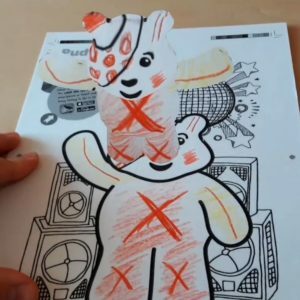 Each target image can be removed or edited from the app. Note: some initial trackers uploaded by the creator of this project are blocked from removing or editing. Amount of all uploaded image targets are provided. Note: it takes some time to load all images. 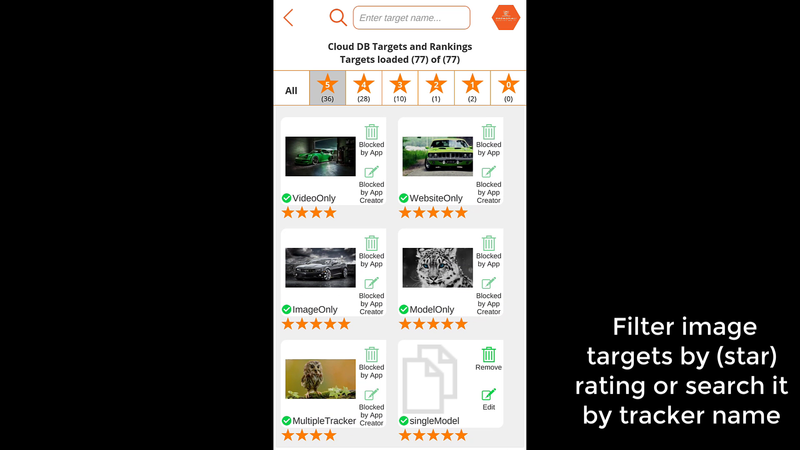 Each image targets can be filtered based on their rating (0, 1, 2, 3, 4 and 5 stars). 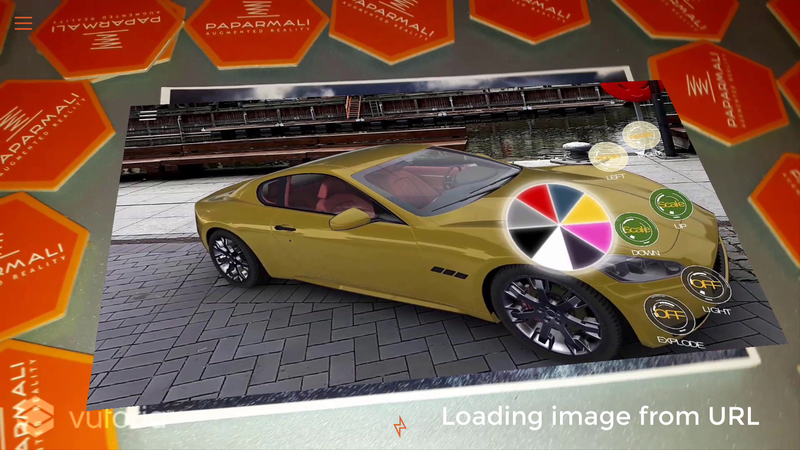 Each image target can be searched based on the image target name. 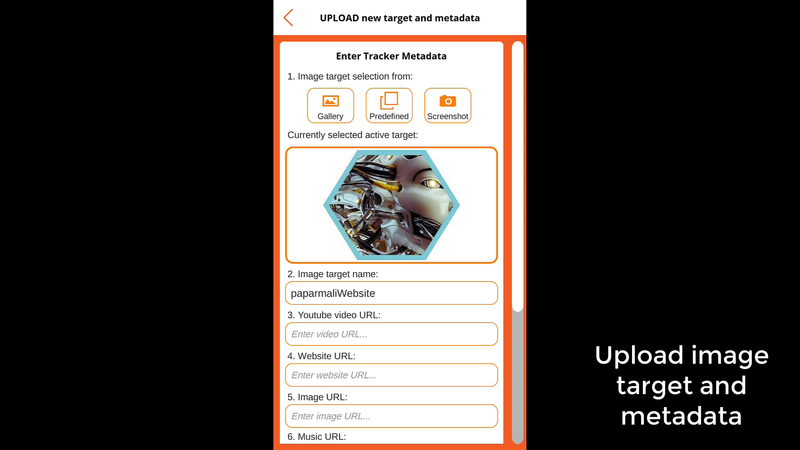 Each image target contains an uploaded target image if, and only if the tracker + metadata was uploaded from the app itself. The tracker image won’t be seen if such tracker was uploaded from within Vuforia portal. 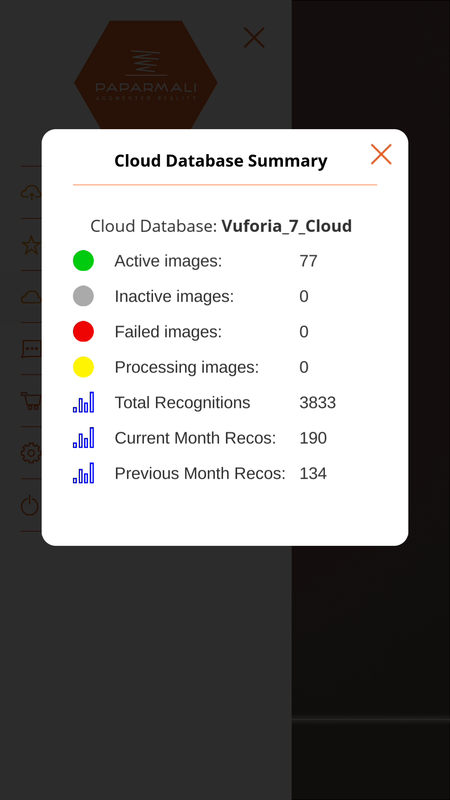 This is because once the trackers are uploaded to Vuforia DB, the tracker image is saved on server separately as Vuforia Web Services doesn’t provide the possibility to acquire that image directly from them. 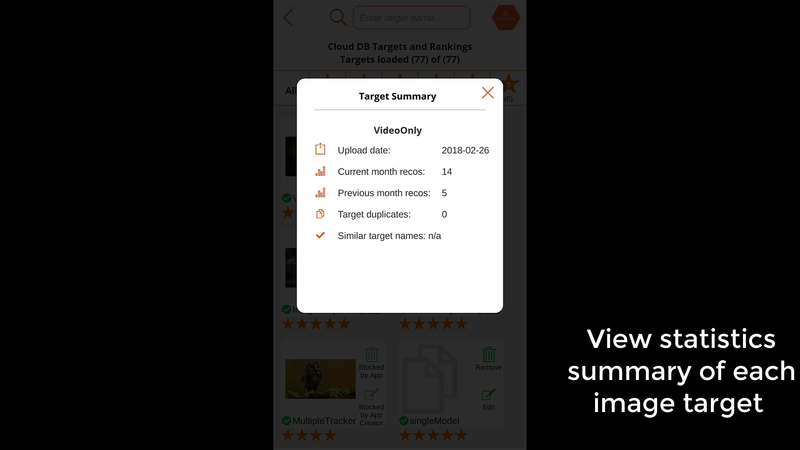 Each image target contains summary and can be viewed once you click on it: upload date, current month recognitions, previous month recognitions, whether similar targets exists (duplicates) and names of the duplicates are provided if such trackers exists. 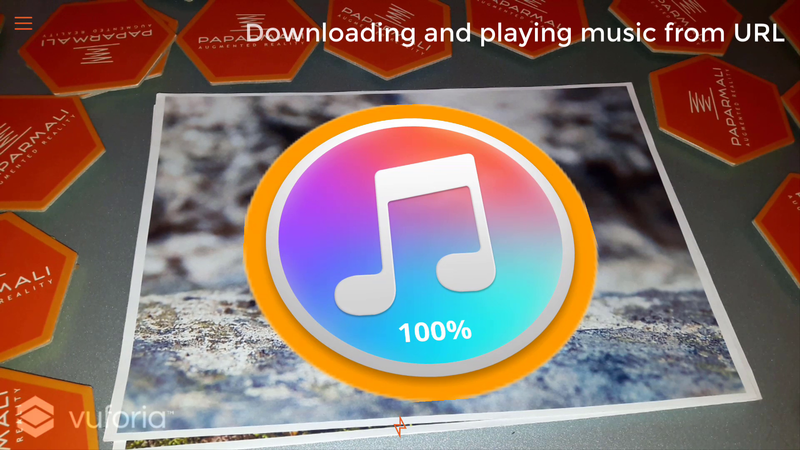 Loader was added to indicate the loading progress until the music starts to play. Loader was added to video plane as well. 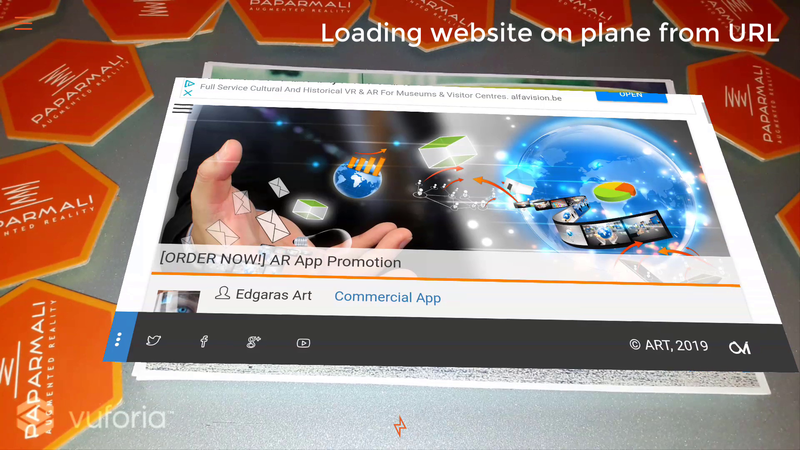 Website augmentation on plane was added with ability to scroll and click on the content. This website augmentation mode can be change to as overlay within menu in “AR Settings”. 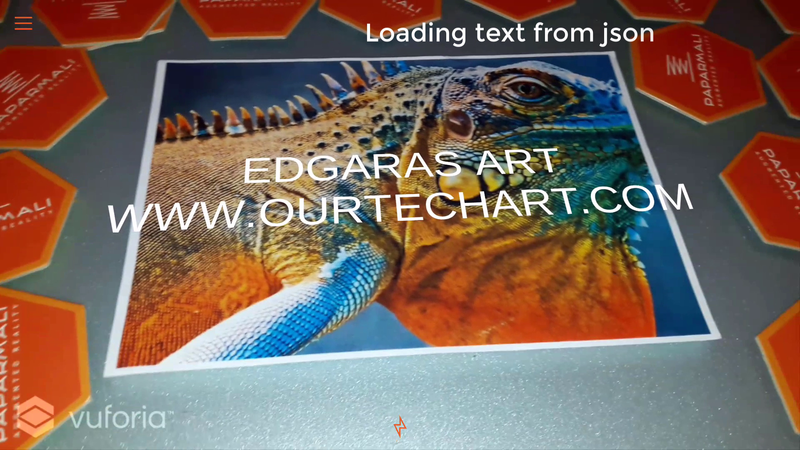 If image URL (metadata) is entered before uploading image target to cloud Database it is checked whether the URL contains supported image file extensions *.jpg and *.png. Informational popup should appear, if image doesn’t contain *.png or *.jpg file format (while entering metadata). Vuforia camera focus was added. Metadata coding was changed to UTF8 – this allows you to use letters/words in case it’s Non-English, for instance, Lithuanian or Russian. 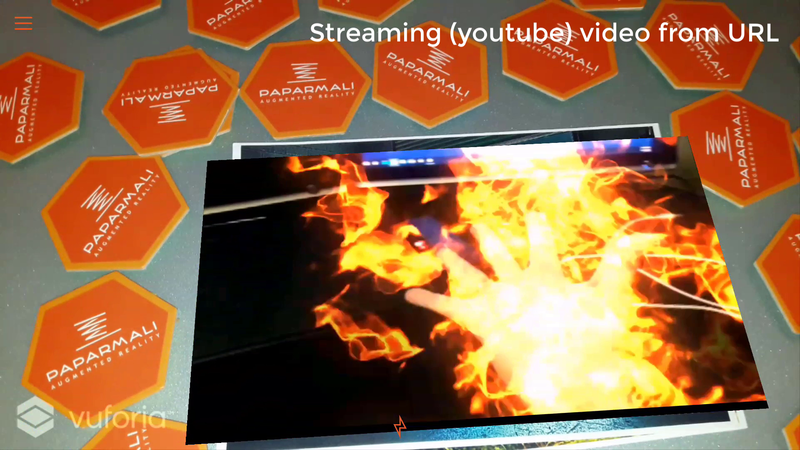 Paparmali 3 is an update of Mimic 15 – Augmented Reality App based on Vuforia Cloud Recognition. This Mimic 15 project will do the job for you! Hello. Thank you for your interest in my project. 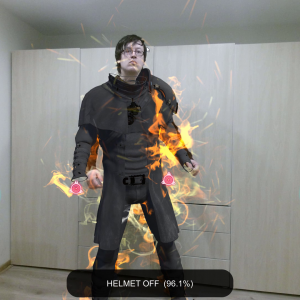 Yes, it is made with Unity3D and both of these platforms (Android and iOS) are supported. So if I pay, can i download the entire project to take it like a base for other project? Also… Do you includes some guide or something to understand how it was builded? After I pay, could you solve doubts and give some support if i´ll need? Thanks a lot and sorry if i got many question but I´m so interested but I need to be 100% sure. Exactly, I was making this project for such purpose. Documentation is included within the project explaining the scripts that were used, how to build AssetBundles, where to change Vuforia client and server keys so you could work with your Vuforia Cloud Database (account). Do you think you can develop the same features with it? Thanks! I’ve been testing EasyAR a while ago I haven’t used Cloud recognition on it, but I don’t see a reason why it couldn’t be adapted accordingly. I could ask you how much it would cost to make it for easyar and how long would it take you? ¿tiene plataforma Web en donde se administra? It’s done through Vuforia portal. Hi, thanks a lot for your answers. It´s confirmed, I will purchase the mimic project during this week. After i purchase the project, I hope you could help me if i´ll need. Hello! Does it works with last Unity version? But I have a query. Is it possible to hide the logo Vuforia from camera ? Hello, thanks! If you want to hide Vuforia logo, you need to buy a license. 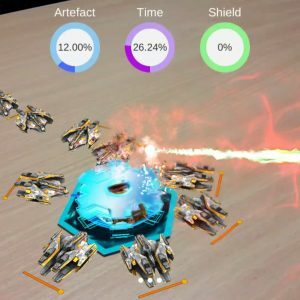 You use “cloud image target” or images targets are already in the unity project? Because I would like to add target images in my application using only vuforia web services without updating my application. Cloud image targets are used. This project exactly fits your needs.